The Football Federation of Australia hosted Ghana in an international friendly match with the Socceroos in May 2008, hoping to demonstrate Australia’s support for the game of soccer in the build up for a bid to host the 2018 FIFA World Cup. Instead of focusing on the Socceroos, the marketing team drew attention to the need for Ghana supporters, creating a fake Ghana fan club who needed someone with an H on his or her chest to complete their visual impact. The club went onto the streets of Sydney, appealing to the public to attend the game and be their missing “H”. The ambient campaign drew attention on blogs and national news programmes. 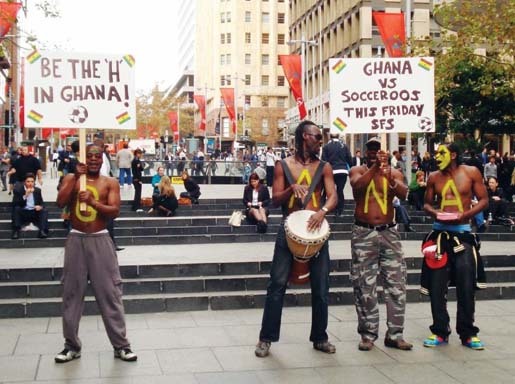 Back in 2008 very few Australians knew or cared about Ghana’s soccer achievements. Now they do. Australia meets Ghana in a critical FIFA World Cup 2010 match tonight in Rustenburg, South Africa. The Missing H campaign was developed at Lowe Sydney by executive creative director Dave Johnson, copywriter Nathan Lennon, art director Dave Gibson, agency producer Charna Rifai, editor Kris Rees, account director Nathan Quailey and account manager Guy Lovell. The campaign won a Gold Media Lion at Cannes International Advertising Festival in 2009.